There is nothing more iconic than a dozen long stem roses in a crystal vase. It’s classy and classic, but it has also been done a million times over. The mighty vase will always have a place in décor, but interior designers and florists are moving on. When you’re deciding what to do with your next bouquet, you might want to look beyond the vase, too. We’ve become so accustomed to seeing vases that any other type of vessel catches our eyes. Florists have also become smitten with using alternatives because they allow them to showcase their creativity, give the bouquet more personality, or to help the arrangement tell a story. A vibrant bouquet is nature incarnate, but you can bring even more of the outdoors in by using natural elements to serve as your vase. Consider placing your flowers in a nest or basket. You can also do a little DIY to give a container an earthy façade. With a little glue, some twigs, rocks, or moss, you can make any fresh-cut bouquet look like it sprung up in your home. Believe it or not, certain fruits and vegetables make great holders, too. For example, a hollowed out pumpkin or other gourd can bring seasonal charm to an arrangement, while a carefully-carved cabbage can be eccentric or fresh. In these instances, it’s a good idea to place another container inside the vessel, so the flowers are happy and get plenty to drink. If these ideas seem a bit too much for your tastes, you can provide earthy visual appeal by layering sliced lime, orange, or cucumber on the inside of a clear glass container, too. It’s easy to make a display look unique and funky by using reclaimed items from your home or a vintage shop. Let your imagination guide you. Glass bottles from milk, wine, and fizzy drinks are favourites and come in a variety of sizes, shapes, and colours. Jars and old medicine bottles can be fun and quirky, too. Tins of all sorts, from tea to spices, are adorable as well. Just be sure to wash whatever container you select out thoroughly with soap and water before using it and rinse it well, to make sure the flowers stay healthy and fresh. When you receive a bouquet and don’t have a vase on hand or you intentionally scour the kitchen for a holder for your flowers to add country charm, you’re sure to find many suitable options. A simple kettle and teacups looks quaint, yet provides a bit on unexpected panache. Carafes are also ideal. 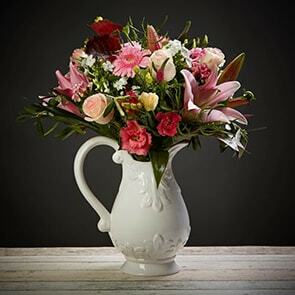 Have a Great Vase-Alternative But No Flowers it Test it Out? At Bloom Magic, we specialize in creating high-quality bouquets that will brighten your home and your spirits. Each bouquet is made from carefully selected fresh flowers, then carefully arranged and hand-tied by one of our artisan florists. Whether you choose from our bohemian-chic Californian Collection, our stunning Classic Collection, or our upcoming exquisite Parisian Collection, you’re sure to receive a bouquet that will make you smile.